But, the best thing I found, by far, was an actual photograph of what the church looked like in the 1980s. This picture was in a 1983 edition of the Herald. You can see they had not yet added the brick sign, and had only one cross in front. Also notably missing is the steeple. It looks more Art Deco without the steeple on it. I think our renovation may be bringing it back to its past! I’ll be sure to pass this picture on to our architect! One more thing you can easily spot is the Rossen House, still happily sitting behind the church. The big wall of the industrial building next door was already there, though. I think you can see a little bit of the Gillis House in the far back. I wish I could see if the basement windows were there at this point or not. I’m still hoping we can find other photos in the museum in the town when Melanie at the Chamber of Commerce and I take a field trip over there. We may learn even more. 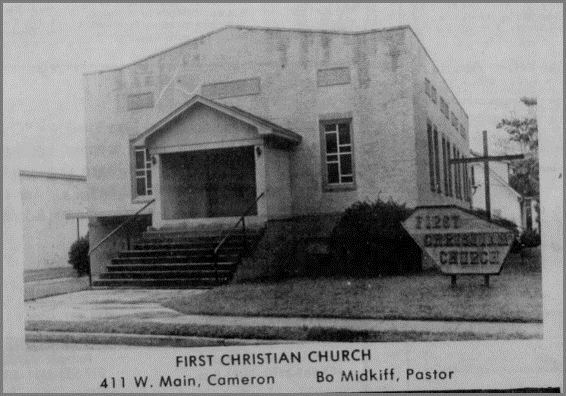 The church as it appeared in April of 1983. Hey, readers. If I make a typo in the title of a post, do let me know! I can’t believe I let it say “Historrical” for a whole day! Bad professional proofreader I am! You’re excused! Thanks for the great history of this building. Thanks, Larry! And thanks for reading!